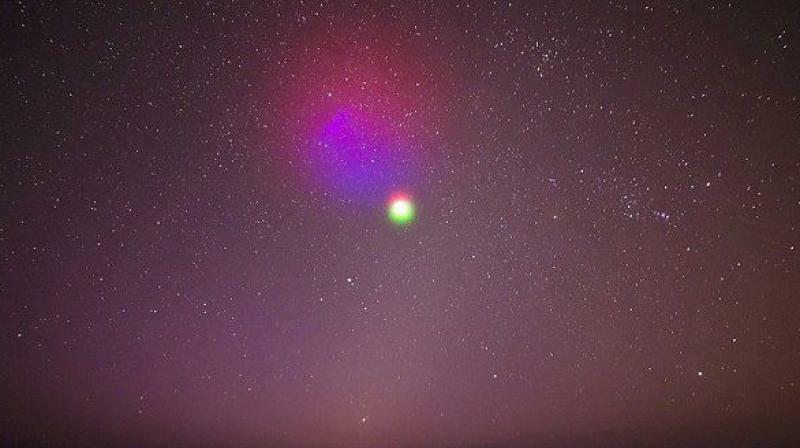 A high-flying science experiment may colour the skies above the US mid-Atlantic coast with bluish green and red clouds on Sunday evening, as NASA seeks to learn more about charged particles at the top of Earth's atmosphere. A small rocket carrying 10 canisters of barium and other chemicals is due to lift off from Wallops Island, Virginia between 9:04 and 9:19 p.m. EDT. About five minutes after launch the canisters, which are about the size of soda cans, will release blue-green and red vapours that will gather into artificial clouds potentially visible from New York to North Carolina. The luminescent colours are due to sunlight interacting with the chemicals barium, strontium and cupric-oxide, the US National Aeronautics and Space Administration said on its website. Although the flight will last about eight minutes, the colourful clouds could linger for 20 minutes, depending on atmospheric conditions. NASA ground stations at Wallops Island and Duck, N.C., will track the clouds so scientists can learn more Earth's ionosphere, a layer at the top of the atmosphere of charged particles that shoot out into space, creating effects including auroral displays over the planet's polar regions.